How to get TuneUp Utilities 2009 License Key for FREE? Firstly, go to the promotion page. 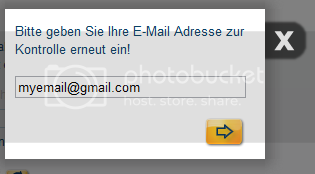 Enter your email address with correct captcha code and click on the “Produktschlüssel anfordern” button to submit the request for a license key. Next, a box will pop up which will look like the above. It’s an email confirmation box. Simply enter the email again that you entered previously and click on the arrow. Now, log into your email and check for a TuneUp Email. Click on the confirmation link in the email. You will be taken to page where you can find your free license key for TuneUp Utilities 2009.Make a note of the key. Next, download TuneUp Utilities 2009 and install it. Once done, use the above received license key to activate it.